These chocolate cupcakes are decorated with creamy vanilla frosting "bandages" and chocolate chip "eyes" . 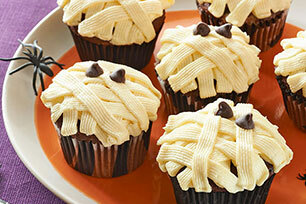 But that’s only part of the reason these Mummy Cupcakes are yummy! Beat pudding mix, milk and sugar in large bowl whisk 2 min., stir in Cool Whip. Spoon into pastry bag fitted with basket-weave tip. Decorated cupcakes can be stored in refrigerator up to 8 hours before serving. Fill a resealable plastic food storage bag with pudding mixture; seal bag. Cut corner off bottom of bag, then squeeze pudding mixture from bag onto cupcakes.